Holy crap. This is one of the funniest things I’ve seen today. 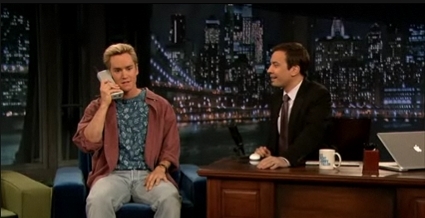 Last night, Mark-Paul Gosselaar made an appearance on Late Night with Jimmy Fallon. For the entire interview, Mark-Paul Gosselaar was in character as Zack Morris, our favorite lead character from the early 1990’s TV show Saved by the Bell. The bit was awesome. I’ve gotta say that Jimmy Fallon strikes gold sometimes, and this was one of those times. Throughout the interview, Jimmy keeps quizzing Zack, trying to deduce whether or not Zack Morris is really Zack Morris. There were references to Bayside High School, Mr. Belding, the Max, Kelly Kapowski, Jeff, Jesse, the Malibu Sands resort where Zack worked that one summer, The Attic nightclub – and even a reference to Zack’s unbelievably high score on the SATs (1502 to be exact)! He even did the Zack Morris patented time-in/time-out thing. Jimmy even froze during the bit. At one point in the interview, we hear a phone ringing, and Zack reaches back and pulls out his gigantic early 1990s cell phone. 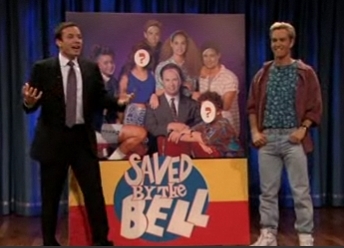 Of course, Jesse Spano is on the line, and Zack confirms that he and Jesse will be attending Jimmy Fallon’s Saved by the Bell Reunion. I can’t wait for that! I’m so excited, and I just can’t hide it! I’m so scared… (just a little Jesse Spano on caffeine pills speed joke). 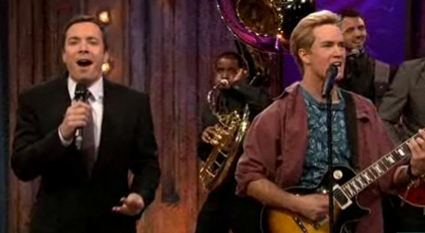 At the end of the interview, Zack Morris mentions his band, Zack Attack. Jimmy says something like, “Oh, I thought you all were just lip synching the whole time.” Jimmy then invited Zack to prove him wrong by asking him to perform as Zack Attack with the Roots as the backing band. Friends Forever was the song, and it was amazing. Zack did his best falsetto voice and actually plunked around on the guitar. He wasn’t terrible, but the funniest part was just watching him stay in character, a character from nearly 20 years ago. And he did it pretty well, I’d say. God Bless Zack Morris and Saved by the Bell. One of my all-time favorites.